With a crust made of graham crackers and a filling made from the heart, an aspiring baker prepares a No-Bake Strawberry Vanilla Cheesecake for her boyfriend. 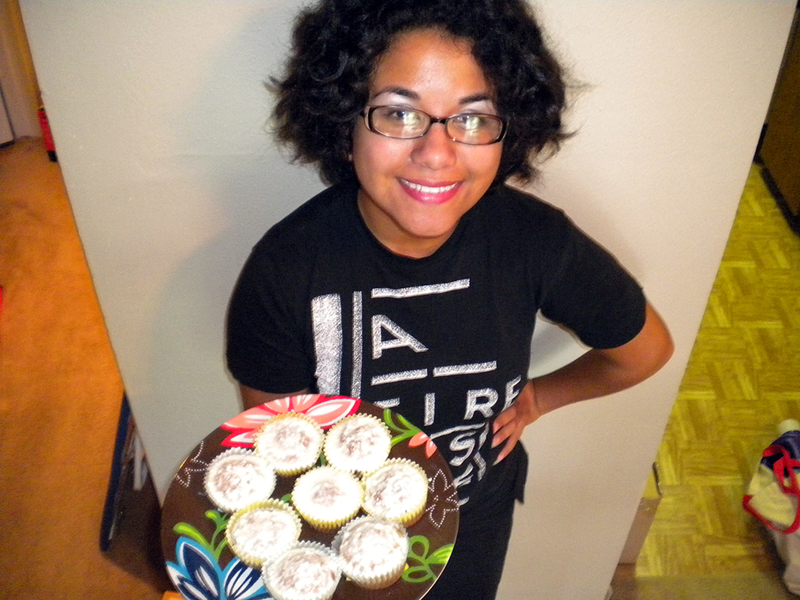 With limited resources while living on-campus and a desire to bake for special occasions, graduating English-communication arts senior Denice Hernandez finds a way to bake in the comfort of her own room. After living on-campus for the past three years, Hernandez found a way to practice her baking skills without a kitchen. “This no-bake recipe is really great because I didn’t need a kitchen, and it was a lot more simple too,” she says. Although Hernandez enjoys perfecting recipes she knows her boyfriend will love, her determination does not end when the timer rings. Her passion lingers in other areas just like the scent of her sweet treats. She is graduating a semester early and has been published in three established newspapers including the San Antonio Express News. “I don’t think my ‘dream job’ is just one thing in one place; I think I am going to have a lot of different dreams, and it is just a matter of me fulfilling them all,” she says. Hernandez currently finds herself happiest when her boyfriend is around. She realizes that baking is most enjoyable when she is does it for others. “For me, it is more meaningful to take the time and bake something than to just go out and buy it,” Hernandez says with a smile on her face. First, mix graham cracker crumbs, sugar and melted butter in large bowl. Press the mixture into a nine inch pie pan and spread evenly. Place crust mixture in refrigerator to chill while preparing the filling. In a bowl, beat cream cheese until smooth. Add sugar and vanilla extract to the cream cheese. In separate bowl, beat whipping cream with a whisk until it becomes fluffy in texture. Fold the fluffy whipped cream into the cream cheese. Pour the mixture into the graham cracker crust. Let cheesecake chill overnight. Top with your strawberries, or other fresh fruits. Makes 6-8 servings. A genuine love for food, a sweet tooth and a curious desire to try new desserts is all it takes to turn an ordinary chef into a cupcake fanatic. Ari Rivera graduated from St. Mary’s University with a bachelor’s degree in English-communication arts, and is currently pursuing her second degree in forensic science. “I would like to get into serology, pathology, or even research. I would really like to get into that and open up a bakery later in life,” she says. From an early age, Rivera began exploring the world of baking with her mother and sister, and her love for oven treats has been growing ever since. In fact, Rivera’s recently perfected dish, tropical pineapple cupcakes with citrus cream frosting, was created from a recipe she selected from a cupcake book given to her by her sister. Rivera brought baking back into her life after being inspired by a feature film she saw some years ago. “My passion for baking was left on the back burner for a really long time, until 2007 when I watched Stranger than Fiction. I loved Maggie Gyllenhaal’s character and I realized, I definitely want to own a bakery like her one day,” says the aspiring pastry chef. Although cupcakes and science seem to be worlds apart, Rivera says baking is a scientific process. “It is scientific—the way chemicals, ingredients and flavors come together,” she says. Getting proportions right is often the most challenging part of the baking process, she added. According to Rivera, the best part of a cupcake is, simply, the cake. Spicy Asian foods are also a favorite of the cupcake chef. Rivera says she enjoys the nurturing and feminine aspects of baking, but she also loves the art of making a mess. The cupcake enthusiast admits to a couple of kitchen blunders in the past. “I have spilled more mixes than I would like to admit,” the pastry chef says with a grin. Rivera encourages beginners to have a sense of humor when learning how to bake, and most importantly, dare to experiment. First, preheat oven to 350 degrees Fahrenheit and place twelve cupcake papers in a muffin pan. Then, finely chop pineapple slices and set aside. In a large bowl, mix butter and sugar and beat together until light and fluffy, then gradually beat in the egg. Add the flour to the mix and, using a large metal spoon, fold all the ingredients in the mix. Next, fold in the pineapple and pineapple juice. Finally, Spoon the batter into the paper cases. While cupcakes are baking, prepare the frosting. Mix the butter and cream cheese in a large bowl with an electric mixer until smooth. Then sift confectioners’ sugar into the mix and beat it all together; gradually beat in the juice from the lemon. Let the cupcakes cool before applying frosting. Once frosted, store cupcakes in refrigerator and serve cool.